By Audrey Golden. Sep 7, 2015. 9:00 AM. On the corner of Klapparstígur and Hverfisgata, located in the heart of downtown Reykjavík, sits the last remaining antiquarian bookstore in Iceland. Bókin, the bookstore itself, is located on the first floor, but the owner has more rooms upstairs with books that haven’t yet been shelved. Downstairs, the books are in order by genre...sort of. Sections include, for instance, “Poetry,” “Novels,” “Icelandic authors,” and even a nebulous portion entitled “Mixed books.” Upstairs, the texts have been placed as they’ve come in, and the book hunting becomes even more exciting. I happened to spot a number of first and early editions, in the original Icelandic, of the Nobel Prize-winning novelist Halldór Laxness. In addition to books in Icelandic, the shop has a number of titles in English and Danish. The current owner of Bókin, Ari Gísli Bragason, has a family literary history of his own. When we first reached out to him about visiting his store in Reykjavík, he told us that his mother was the Icelandic poet Nína Björk Árnadóttir. After meeting Ari and learning more about his shop, he told a story about his mother residing in the same nursing home as Halldór Laxness. But that's not the store's only brush with international acclaim. Pointing to a print of Bobby Fischer inside the shop, Ari recounted how the famed chess grandmaster had frequented Bókin as he lived out the remaining days of his life in Iceland. Ari also talked about inheriting the bookstore from his father, and the variety of books he seeks out for the shelves of his shop. We had the chance to conduct a quick interview with him in his whimsical and spirited use of the English language. Books Tell You Why: How did you get into the antiquarian book business? Ari: In 1996, after my second year in Wheeling Jesuit University in Wheeling, West Virginia, I traveled back to Reykjavik, capital of Iceland, for the summer. 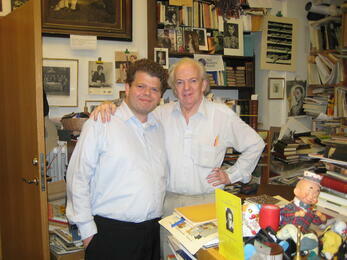 My father offered me work in his then-big antiquarian bookshop based in the downtown. I did not go back to college, and I have been stuck with these old books since then. Now it is, according to the Calender, 2015. The world is getting smaller, and I ask myself, when is this book thing coming to an end?!!! Books Tell You Why: What are some of the largest collections in your shop? In Icelandic? In English? In other languages? Ari: In my shop today, the main collections are books about Iceland, its people and places, and general history books. I also have sections on poetry and arts. The shop is divided into 21 small departments. So many visitors and customers are not native Icelanders, so I try my best to have foreign books. Today I have approximately 6,000 book titles in many languages and on wide subjects. 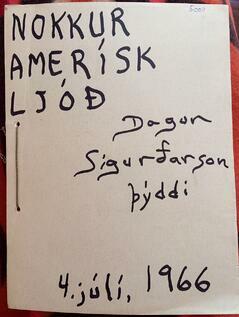 Books Tell You Why: You mentioned to me that you're the last remaining antiquarian bookstore in Iceland. Can you talk a little bit about how you've witnessed a waning of the physical book? Ari: There used to be more than 20 antiquarian bookshops in Reykjavík only 15 years ago. But my shop is now the only one left, run in the good old fashion: we are open 5-6 days a week from 11 a.m. to 6 p.m., and the service is quick and slow at the same time. The book will never be put "down" because it is so strong and good. It survives all attacks made on her by modern men and machines. Or men-machines, one could say — not so much is handled on a personal level in modern times and with modern technology. Books Tell You Why: What are some elusive books that you'd like to find for your shop? Ari: My personal favorites are poetry and theatre books, such as those of Noel Coward or Leonard Cohen, the latter of whom is one of the best poem and songwriters the earth has had. Halldór Kiljan Laxness, maybe our best-known author and Nobel Prize winner, is also one of my favorite writers. Books Tell You Why: Are you an antiquarian book collector yourself? If so, what's in your private collection? Ari: I try not to collect books, but nice contemporary vellum bindings from the 15th or 16th centuries are hard to resist, and I have a small collection of them, mostly Aldus editions. Books Tell You Why: Any closing words for book collectors who are just starting out? Ari: I believe in books — the original nature of them and their natural warmth — and I believe that the readers and collectors who love them and follow them are peaceful soldiers in full arms who will last forever in our fast-going world. Many thanks to Ari for taking the time to talk with us about his antiquarian bookstore in Reykjavík and his personal experiences with collecting and selling books in the northernmost capital city in the world.